A traditional country stick, fitted with an antler V-shaped handle, to be carried with the thumb resting in the V. At the end of one of the antler prongs is a powerful neodymium magnet, so that the stick can be used for collecting spent cartridges in the shooting field. 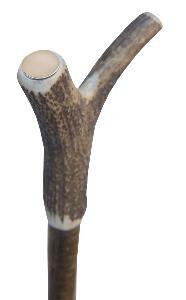 The shaft is made from hazel wood, greatly prized for its interesting colour and texture. Fitted with a metal ferrule. Overall height approximately 135cm (53"). Item weight is approximately 620g. - Neodymium magnets are much stronger than 'ordinary' magnets. Keep a safe distance (50mm+) between the magnets and all objects that can be damaged by magnetism. These include mechanical watches, heart pacemakers, CRT monitors and televisions, credit cards, diskettes and other magnetically stored media. Heart pacemakers will be affected by the close proximity of a magnet. Magnets can set a pacemakers working in a way that is not suitable for the pacemaker user and that might affect their health. - The magnet is nickel-plated. If you suffer from a nickel allergy then you should avoid prolonged skin contact. - The magnet is attached with a very strong adhesive. However, if for any reason it should become unattached, take great care that no one swallows the magnet as this can cause significant health problems.